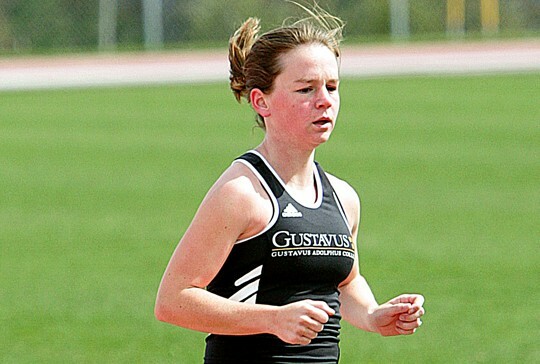 Former Gustavus Adolphus standout cross country runner Nichole Porath (Petersen) `05 has qualified and will compete in the Olympic Trials Marathon on Saturday, Jan. 14 in Houston, Texas. It will be the first time that the men’s and women’s Olympic Trials Marathon will be hosted on the same day, at the same site. The event will determine the three men and three women who will represent the United States in the marathon at the 2012 Olympic Games in London. Porath, a native of Arco, Minn., was an All-Conference performer in each of her four years under the direction of Head Coach Scott Jerome, taking home the honor in 2001, 2002, 2003 and 2004. Porath finished inside the top-10 at all four MIAC Championships with her best finish coming in 2002 when she placed third after crossing the finish line in 18:50.3 at the meet. She was a member of the first Gustavus women’s cross country team to win a MIAC Championship in 2003, placing fourth with a time of 18:55. Porath advanced to the NCAA Championships three times, placing 68th in 2001, 43rd in 2002, and 45th in 2003. The race will air live on NBC from 3:00 p.m. to 5:00 p.m. (EST). More than 250 athletes are expected to compete in the 2012 U.S. Olympic Team Trials – Marathon. There are currently 147 men and 185 women qualified to run this Saturday. For more information on the Olympic Trails Marathon, please follow the link below. Fans can also follow Nicholes’ online blog chronicling her journey from Gustavus to Houston.